barry thinks you should make this dessert. now. strawberries are on sale, it's +30 degrees out today, and who doesn't love a dash of tequila in their lives? 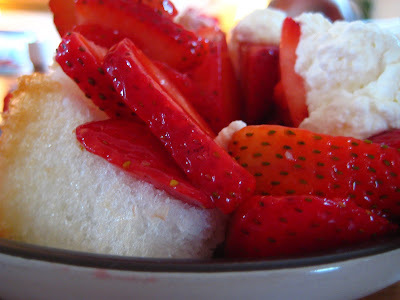 i made this quick, delightful dessert last weekend for sunday dinner, and had rave reviews for it. it also helped that the hardest thing to do was slice the strawberries (i'm feeling particularly lazy of late if you haven't noticed with the lack of writing). 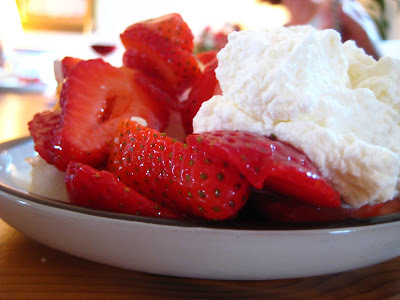 go pick up some strawberries, an angel food cake, whipping cream, a lemon and some white chocolate. slice up the strawberries, splash them with some tequila that i'm assuming you have on hand, and set aside. now whip up the cream with an electric mixer (or whatever) and fold into it some lemon zest and chopped up white chocolate. oh yes, i know. now just pile high all ingredients on each plate and enjoy the decadence.